Szukasz łatwych do wykonania trików, robiących ogromne wrażenie na widzach?Oto wyczekiwana kolekcja jednych z najlepszych efektów karcianych!Za jednym zamachem poznasz sekrety tych 12 efektów: -The Fabulous Egg - Poker Transformation - The Starving Monkey - Find the Queen - Incredible Reverse - Four Kings - Surprising Girls - Chameleon Backs - The Vampire - Three Card Monte - Let's Swap a Card - Think of a Number Nie przegap tej fantastycznej kolekcji!-W pudełku wystawowym otrzymasz po 4 sztuki każdego efektu, łącznie 48 sztuczek.-Eleganckie pudełko wystawowe ma wymiary 27 x 28 x 26.-Karty mają rozmiar pokerowy i są wyprodukowane z wielką dbałością. Niektóry z nich wykorzystują karty Bicycle.-Zakup tej kolekcji to ogromna oszczędność, biorąc pod uwagę ceny poszczególnych trików, a dodatkowo otrzymujesz DARMOWE pudełko wystawowe. Do you have a shop or a showroom and would like to show your new clients very easy tricks with a high impact? At last there is a collection of some of the best packet tricks produced by our company! All in one go you will “bring home” these 12 wonderful effects: - The Fabulous Egg - Poker Transformation - The Starving Monkey - Find the Queen - Incredible Reverse - Four Kings - Surprising Girls - Chameleon Backs - The Vampire - Three Card Monte - Let's Swap a Card - Think of a Number Do not miss out on this fantastic collection! 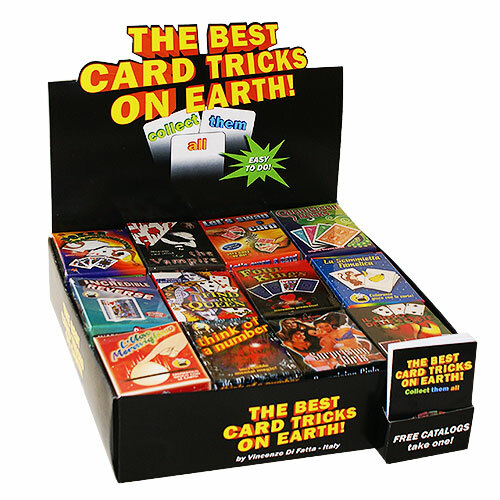 - Inside the display we supply 4pcs of each trick for a total of 48 tricks. - The elegant display box measures cm 27 x 28 x 26 (inches 10,6 x 11 x 10,2). - The poker size cards are carefully produced, and some of the packet tricks are produced with Bicycle cards. - Buying the collection you will greatly save on the regular price of the single tricks and receive the display box FREE.